Today, the Relay For Life movement is the largest and most successful community fundraising activity in the world, and that is thanks in no small part to every single one of the more than 4 million participants who join us around the track each year. Survivors and caregivers around the world come together every year to spread the message of hope – a message that can be understood in any language. It is hope that brings strength and courage to survivors, knowing they are not alone in the cancer journey and that one day, together, we will finish the fight against cancer once and for all! A highly visible symbol of a personal victory over cancer, the Global Relay For Life Heroes of Hope and their stories encourage support of and participation in the programs of each global cancer organization. More than simply inspiring us, cancer survivors and caregivers reaffirm the missions of our organizations and reinforce, in a personal way, the need for all of us to continue to fight back against cancer. The Global Relay For Life Heroes of Hope survivorship initiative involves the selection of Heroes of Hope from Global Relay For Life participating countries. • Give each Global Relay For Life member country an opportunity to recognize one or more cancer survivors who have impacted their community. • Give one or more cancer survivors the opportunity to serve as a voice for their country’s cancer organization. • Encourage other cancer survivors to actively share their own cancer story and give hope to others. Heroes of Hope are extraordinary cancer survivors who represent courageous voices of hope. In telling their stories, they will encourage others to support their cancer organization and to get involved in Relay For Life events. As ambassadors of their countries’ cancer organizations, these Heroes of Hope will inspire other survivors and expand the whole world of cancer survivorship. Congratulations to our 2015 Global Relay For Life Heroes of Hope! 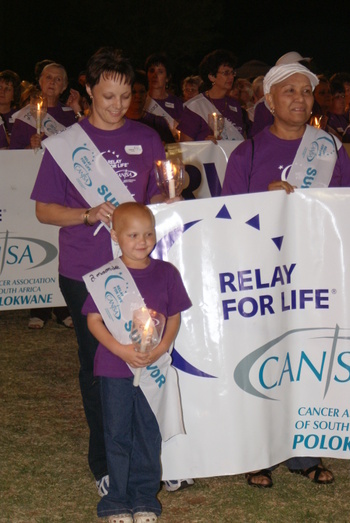 A recent Relay For Life® event in Nelspruit, South Africa, drew large crowds and local media coverage. Volunteers of the Cancer Association of South Africa (CANSA) organized the Relay in Nelspruit from March 7-8, at Laerskool Nelspruit Sports Field. The event built on the success of last year’s first-ever Relay in the city. This year, more than 5,000 participants and 134 teams joined together in the fight against cancer. 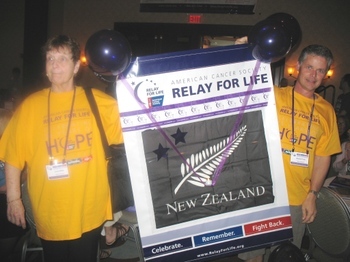 The event was covered in two issues of the Nelspruit newspaper Lowvelder, which featured related stories and photos as well as a personal message from Dr. Gordy Klatt, the American Cancer Society volunteer who inspired the Relay For Life movement. The publication of Dr. Klatt’s message and success of the Relay event drew praise from CANSA and members of the Nelspruit community and helped showcase how Relay For Life is making a difference in communities in South Africa and around the world. Representatives of the American Cancer Society’s International Relay For Life® program were honored to attend the Cancer Research UK (CRUK) Relay Summit on October 17-19 in Stratford-Upon-Avon, England. Among the guest speakers for this event was Jeff Ross, American Cancer Society South Atlantic Division board member and National Relay Advisory Team member. During his keynote address and a panel discussion, Jeff demonstrated his huge passion for Relay and proved once again that there is an international movement of Relay volunteers and staff committed to eradicating cancer. The summit convened dedicated Relay volunteers and staff from all over the United Kingdom, all committed to learning how to grow and develop their Relay programs as part of the global fight against cancer. 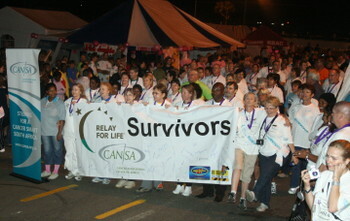 The stadium of the Pietersburg High School in Potokwane, South Africa, was transformed into a venue of hope and celebration on October 3 and 4, 2008, to accommodate a historic event: the largest Relay For Life in South Africa. Despite being located in Limpopo, the poorest province in the country, the Potokwane Relay drew over 162 registered teams, families, and individual participants – including more than 200 cancer survivors – and raised 729,000 South African rand for the fight against cancer. The event launched with the Survivors Lap, in which 180 cancer survivors took to the stadium track amidst singing, dancing, and cheering. Following a sit-down dinner on behalf of the survivors, registered teams had their turn walking the track. An estimated 3,000 lumunaria candles burned during the event’s Luminaria Ceremony, creating a tranquil glow of remembrance. The Relay came to a dramatic close the next morning with the release of 200 doves. Proceeds raised by the Potokwane Relay For Life event will go toward efforts to help the Potokwane Region of the Cancer Association of South Africa (CANSA). This organization will work improve the lives of local cancer patients and their families through a host of initiatives, including monthly prevention and information campaigns; support efforts for the Theunis Fichardt Hospitium, which has taken care of cancer patients and their families for the past nineteen years; and support for the Tough Living with Cancer (TLC) project, which assists children and adults affected by cancer. Twelve Relay volunteers and staff from three continents joined thousands of other participants at the American Cancer Society Nationwide Relay For Life Summit held August 1-2 in Indianapolis, Indiana. The Relay representatives, from Australia (Victoria and Western Australia), Canada, New Zealand, and the United Kingdom, took part in training, shared in the celebration and preparation for the 25th year of Relay, and represented the global family of Relayers – now spanning 20 countries around the world – and their achievements in cancer education, survivorship, fundraising, and advocacy. Prior to the summit, these Relayers met at the International Relay For Life Workshop in Indianapolis on July 31. During this workshop, volunteers and staff shared information on their recent Relay activities and created program and event development strategies to strengthen Relay For Life in their countries. On May 30, under the night sky in Zululand, South Africa, a flare kicked off a remarkable Relay For Life® event that drew more than 3,000 participants. At the vast Zululand Chamber of Business Foundation show grounds, 82 Relay teams gathered to give their hearts, energy, and donations to the Cancer Association of South Africa (CANSA). The crowd of Zululanders, which represented the cultural and demographic diversity of the community, walked, danced, sang, and celebrated through the night to raise more than $25,000 for CANSA activities and programs. More than 600 luminaria bags lined the track as 90 cancer survivors walked the first lap of honor, which was followed by a lap by their caregivers and the CANSA committee. During the closing ceremony, Deputy Mayor Celiwe Madlopha praised the participants, sponsors, and organizers and gave the Zululand Observer newspaper credit for promoting and supporting this successful Relay event. 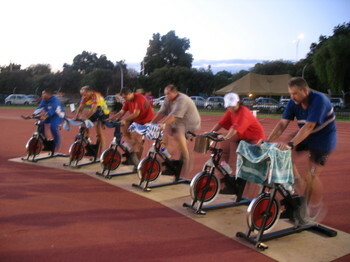 Three hundred participants rallied at the Oudtschoorn Relay event and stayed active with exercises including spinning (above). Joe Cahoon, Mid-South Division chief executive officer, and Ryan Palmer, vice president of Constituent Services for the Mid-South Division, conducted a Relay For Life senior strategy training for leaders of the Cancer Association of South Africa (CANSA) regional offices. During the February 2 briefing in Oudtschoorn, South Africa, the group focused on best practices in Relay leadership recruitment, activities, mission integration, corporate strategies, and discussed lessons learned during Relay’s 20-year history. Gina Myracle, a Mid-South volunteer and Division board member, conducted an intensive training for CANSA Relay volunteers who are gearing up for a significant program expansion this year. After the trainings, the group attended South Africa’s second Relay event on February 3 at the De Jager Sports Complex, a municipal facility in Oudtschoorn. Twenty-two teams, 50 survivors, and approximately 300 participants rallied around the field during the night, staying active with family activities such as hourly exercise classes and cooking contests. 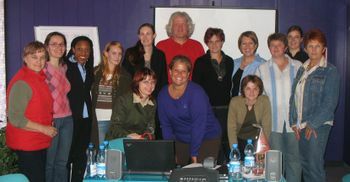 The first in-country training in Slovenia was held in Ljubljana the second week of November. 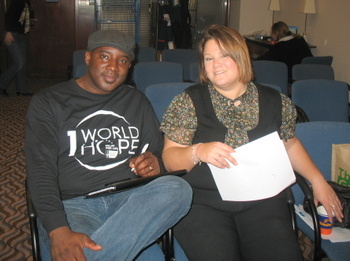 This training was attended by 12 participants and one volunteer from the Great West, Shelley Mauss. Although Slovenia has participated in Relay For Life for the last several years, the country’s Relay organizers are looking forward to applying the skills they have learned to the upcoming events. The Slovenian Relay For Life (Hoja za Življenje za Pre Živele Z Rakom, RTF) is scheduled for spring 2007.